To start looking for a place to live you first have to go to a short housing brief which is held at the housing office, conveniently just outside the door of the Navy Lodge. I'm glad someone had the forethought and put it there as walking across the large base is tiresome. At the brief they told us about the different housing options available to us (on base, off base), showed us the different methods of finding a house (listings at the housing office or real estate agents off base) and how to go about renting once you have chosen a place. Once that was complete we took off in our quest to find a home. Walking into our housing brief we knew that we wanted an off base house or apartment. On base housing was not really an option for several reasons. One being that there were very few options to pick from that would allow for cats. And secondly, living on base would limit our experiences with the Japanese culture, which was our the main reason for coming here. So off base housing it was. We began by following a little off base real estate agents list that we were given at the brief. The list was a little outdated but it did help us find a few places that were kind of out of the way. As soon as you step out of the main gate there are real estate agents everywhere, almost on every corner. Our first stop was directly across from the gate. The process was quite simple. We stepped in, said hello and that we were looking for a house and sat down in the chairs offered. The lady had us first fill out our information and a few basic things we were looking for (house or apartment, pets OK, distance from base or train, number of cars...). Most often the agent would get stuck on the fact that we had cats. Specifying that they had been declawed was extremely helpful. With that info she pulled out a few folders and flipped through several and produced two houses she thought might fit. Almost without fail we were shown two houses and no more. I don't know if it is a cultural thing or if it was our pet limitations. (After about the 6th realtor just showing us two houses got a little frustrating but we pushed on, and God prevailed.) We asked a few questions about the homes, said we would like to see them, a phone call was made and went to see both houses immediately. Seeing a house layout and thumbnail sized photos on a single printed paper is not enough information to make any sort of serious decision on if we liked a place or not. Being our first stop we wanted to experience going to a home to better make future decisions. As we learned quickly having our wish list of things that we were looking for in a house was essential. There were so many homes to look at even with our pet limitations. Pets are almost always negotiable, even if the listing specifies "no pets". Ask. Go in person. Most of the realtors did not even have a computer in their office or updated house listings on their websites. Don't rule out a house if it doesn't have photos. Several houses we looked at didn't and were good options for the right person. Most agents took us to see the house right then and so we were able to see homes very quickly and only had to wait a few times for a scheduled appointment. Real estate agents seem to have a certain list of qualifications that us "orang barat" ("westerners" in Indonesian) are searching for. Having your list helps counter this. The house that we ended up finding 1 1/2 weeks later was actually through a friend's real estate agent whom we had been in email contact with (House Land is who she works for, ask for Maimi). Once we stepped in we knew it was for us, an indescribable feeling. It felt right. We made a verbal commitment on the 13th, the 15th was the last day that Navy families were supposedly being given to look for off base housing and instead were required to look on base. I'm so thankful. 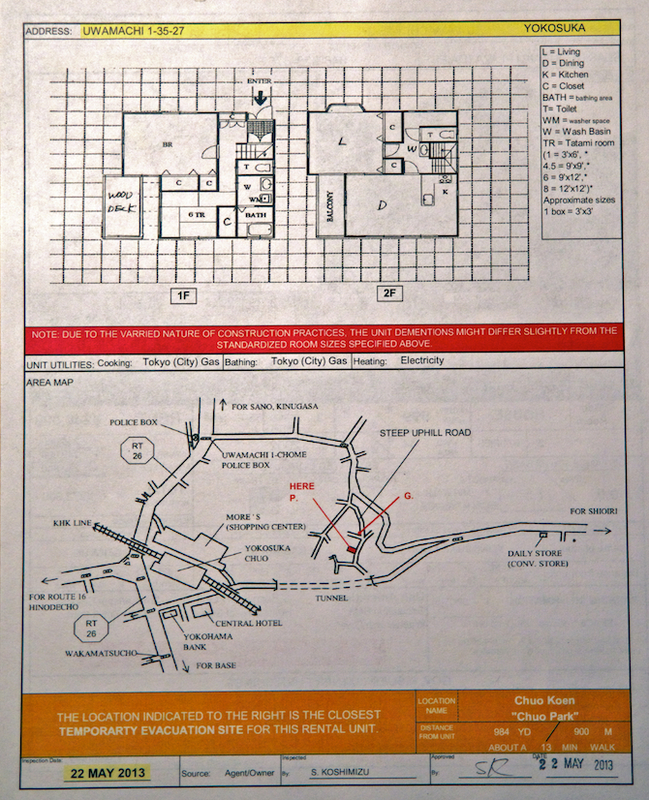 The listing for our house (red and yellow edits made by the Navy contractor that inspected the house) with quite a bit of information. This is typically what you will find when looking for a Japanese place, although usually with less information. To rent a house here you have to put down quite a bit of money up front, usually 3 or 4 times the amount of rent. The extra costs goes to several different parties and some are only deposits which you will then get back once your contract is over. For example we had to pay an owners fee, a realtor agent fee and a pet deposit x2, each equalling roughly a months rent. To top it off this must be paid in cash at the time of signing. Most have to take out a temporary loan to cover the cost. The Navy helps out too. 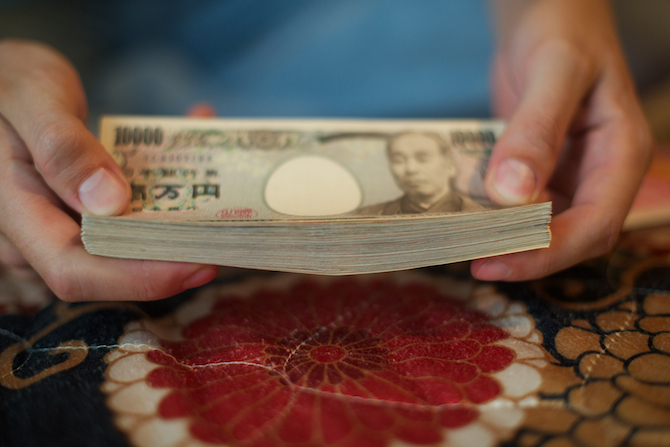 Ever wondered how much $13,000 looks like in cash? Before we could sign our lease and move in the house had to be inspected by someone from the Navy Base. This took them about 8 days. After that we scheduled our lease signing at the housing office and waited anxiously for the date to arrive. On May 30th we moved into our house. It was such an exciting day. We only had our suitcases and an air mattress but we were ecstatic to be in our own place at last. If we were to do it again we would have scheduled weeks in advance our household goods shipment to be delivered the next day. But instead we had to wait another week for it to arrive. The time was well spent however exploring the area and spending time together. The day our household shipment arrived I was a little worried the movers would have trouble getting everything up the stairs and into the house. As you can see our house sits on top of a carport and there is also a second floor. The second floor is actually the living space, kitchen and dinning room with the bedrooms on the first floor. 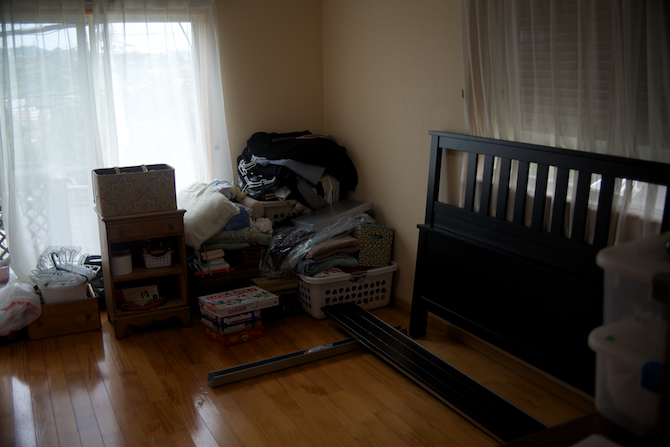 I was pleasantly surprised how quickly everything was moved in. We only had our queen bed and two dressers furniture-wise and those were on the first floor. 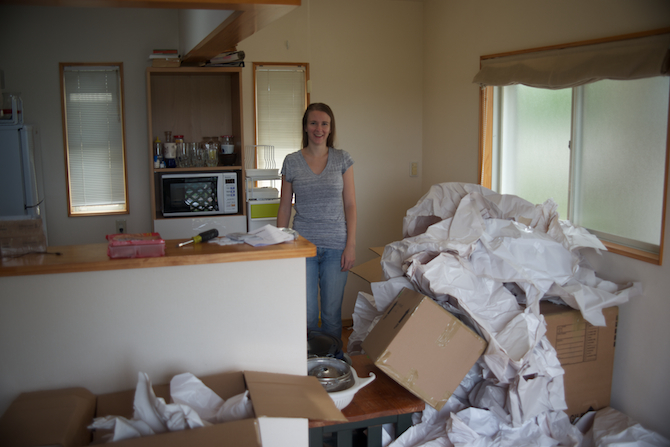 I was able to start unpacking some of the kitchen boxes while Anson directed downstairs. The movers left since they had another move to be at but promised to be back around 3 that afternoon to pick up any boxes or packing material and so we quickly unpacked every box. It's a good habit for moving. Unpacking everything forces you to deal with your stuff and I had quite a few things that went in my get rid of pile. Living out of a suitcase for three months changes how you view stuff. Part Two, a little tour of our house.